Vivekananda Jayanthi was observed on 12th January 2017. The combinations of four celebrations (Vivekananda Jayanthi, School Annual Day, National Youth day. The Inauguration of Mini Science Center) were celebrated together. Sri. NELLAI S. MUTHU Former Scientist, ISRO, NCSTC – National Awardee for Science Popularization was the chief guest. Sri S. Ayyappanji, Secretary of RDP, Vivekananda Kendra Sri. Subramanian, Smt. Shanmuga vadivu, Trustees of Redington foundation were the special guests. Sri. S. Muthu inaugurated the function by lighting the lamp & inaugurated our Mini Science Center, Sponsored by Redington foundation. Speeches on the greatness of Bharath, Views of Swami Vivekananda on Mother Bharat, Greatness of Thirukkural, Aim of students, Discipline of students and the improvement of science were presented by the chief guest. Rs. 10,000/- awarded to the top scorer in std XII (G. Gayathri) by Dr. Muthukrishnan, Eswari Nursing Home, Vallioor in the memory of Dr. Lakshmanan. The prizes were distributed for the outstanding performance of the students in the last academic year. One of our students R. Suman was honoured by the dignitaries for the state level achievement in sports event. Varieties of programmes like drama, dance, yoga, karate, silambam, skit etc. performed by the students exposed their efficiency. Our correspondent Shri. S.K. Subramanian organized the function. इंदौर नगर : विवेकानन्द केंद्र कन्याकुमारी इंदौर नगर द्वारा दिनांक 12 जनवरी से 23 जनवरी तक इंदौर नगर में पुष्पार्पण के ३०० कार्यक्रम का संकल्प किया है ! इंदौर नगर में दिनांक 12 जनवरी को कुल १२० पुष्पार्पण के कार्यक्रम का आयोजन हॉस्पिटल्स, महाविद्यालय, विद्यालय, योग शिविर, हास्य क्लब, आवासीय सोसाइटीज इत्यादी जगह पर कार्क्रम किये गए ! कार्यक्रम में समाज के सामान्य वर्ग ने लगभग ७००० की संख्या में भाग लिया और संकल्प लिया की मेरा प्रत्येक कार्य, कृति और विचार यह राष्ट्र के अनुरूप होगा ! पुष्पार्पण कार्यक्रम में स्वामी विवेकानन्द के जीवन के घटनाक्रम, जयघोष,स्वामी विवेकानन्द चित्र के सामने पुष्पार्पण और अंत में सामुहित संकल्प लेकर कार्यक्रम समाप्त किया गया ! और विचार यह राष्ट्र के अनुरूप होगा ! पुष्पार्पण कार्यक्रम में स्वामी विवेकानन्द के जीवन के घटनाक्रम, जयघोष, स्वामी विवेकानन्द चित्र के सामने पुष्पार्पण और अंत में सामुहित संकल्प लेकर कार्यक्रम समाप्त किया गया ! धार नगर : स्वामी विवेकानन्द के विचारों की प्रासंगिकता सदा बनी रहेगी व वर्त्तमान में विदेशी विचारक श्री स्वामी जी के चिंतन से प्रेरित हो रहे है ! स्वामीजी के जीवन दर्शन से उर्जा प्राप्त कर व्यक्ति अपने आप में बृहद परिवर्तन ला सकता है ! यह उदगार माखनलाल चतुर्वेदी विश्वविद्यालय के कुलाधिसचिव लाजपत आहूजा ने यहाँ विवेकानन्द केंद्र कन्याकुमारी शाखा धार की विवेकानन्द व्याख्यानमाला में व्यक्त किये ! मिलन महल त्रिमूर्ति नगर में आयोजित इस व्याख्यानमाला में उन्होने कहा की इतिहास के अनेक अनछुए प्रसंगों को समझकर भारत की विरासत को समझा जा सकता है तथा स्वयं में परिवर्तन से ही समाज में बदलाव लाया जा सकता है ! कार्यक्रम की अध्यक्षता कर रहे प्रसिद्ध लेखक डॉ. मुरलीधर चांदनिवाला ने संबोधित करते हुए कहा की स्वामीजी ने शिकागो धर्म सम्मलेन में जो सनातन संस्कृति का अलख जगाया वो आज भी प्रकाश पुंज बनकर बिखरा हुआ है ! पूरी दुनिया में स्वामीजी के विचार “वसुधैव कुटुम्बकम” की भावना को बदल देते है ! उन्होंने उपस्थित श्रोताओं से आव्हान भी किया की राष्ट्र व समाज की उन्नति के लिए अधिक से अधिक देने की प्रवृत्ति होनी चाहिए ! नगर में विगत ४५ वर्षों से यह व्याख्यानमाला आयोजित की जा रही है जिसमे अनेक विद्वान् अपनी उपस्थिति दर्ज करा चुके है ! कार्यकर्म में केंद्र के वरिष्ठ सदस्य श्री हरिशचंद्र पाठकजी का सम्मान उनकी सुदीर्घ सेवाओ के लिए अतिथिओं द्वारा किया गया ! साथ ही स्थानीय आनंद हिन्दू अनाथाश्रम, पीपलखेडा की वार्षिक पत्रिका अश्रमवाणी का विमोचन भी इस अवसर पर किया गया ! विमोचन समिति अध्यक्ष श्री उदय वडनेरकर, सचिव श्री सरदार सिंह तंवर व सहसचिव श्री भारत सिंह दसौधि ने करवाया ! पूर्व में स्वस्तिवाचन व प्रार्थना राहुल जाटव ने गाया ! अतिथिओं का स्वागत मा.नगर संचालक श्री सरदार सिंह तंवर व सह संचालक श्री सुरेश राजपूतजी ने किया ! प्रेरक गीत श्री सत्येन्द्र जोशी व श्रीमती श्वेता जोशी ने प्रस्तुत किया ! श्रीमती जोशी के साथ हारमोनि संगत श्री दीपक खळतकर व तबला संगत श्री आशीष पुराणिक ने की ! कार्यक्रम का संचालन विवेकानन्द केंद्र के नगर संपर्क प्रमुख श्री नविन राठोर ने किया तथा आभार इंदौर विभाग प्रमुख श्री नंदन जोशी ने किया ! कार्यक्रम स्थल पर स्वामी विवेकानन्द की जीवन पर आधारित प्रदर्शिनी लगायी गयी थी साथ ही साहित्य सेवा स्टाल भी लगाया गया था ! कार्यक्रम में धार नगर ४०० की संख्या में प्रबुद्ध, युवा एवं मातृशक्ति ने भाग लिया ! जीवन से जुडा होना चाहिए ! उन्होंने स्वतंत्रता और समता को भी परिभाषित किया ! कार्यक्रम में खंडवा नगर के ४०० युवा, मातृशक्ति और प्रबुद्ध वर्ग ने भाग लिया ! खंडवा नगर साहित्य सेवा : खंडवा नगर में विवेकानन्द जयंती के अवसर पर 3 दिवसीय दिनांक 12,13,14 जनवरी को विवेकानन्द व्याख्यान माला में साहित्य सेवा स्टाल लगाया गया ! विवेकानन्द व्याख्यान माला में लगभग ५०० की संख्या में खंडवा नगर जन ने भेट दी और साहित्य विक्रय किया ! उज्जैन नगर साहित्य सेवा : उज्जैन नगर में विवेकानन्द जयंती के अवसर पर पुष्पार्पण कार्यक्रम में साहित्य सेवा स्टाल दिनांक 12 जनवरी २०१७ को लगाया गया ! साहित्य सेवा स्टाल पर उज्जैन नगर के कलेक्टर महोदयजी ने भेद देकर साहित्य सेवा स्टाल की गरिमा बढायी !साहित्य सेवा स्टाल पर लगभग उज्जैन के 100 जन सामान्य लोगों ने भेद दी और साहित्य विक्रय किया ! धार नगर साहित्य सेवा : विवेकानन्द जयंती 12 जनवरी २०१७ के अवसर पर धार नगर में विवेकानन्द केंद्र द्वारा आयोजित कार्यक्रम में साहित्य सेवा का स्टाल लगाया गया ! साहित्य सेवा स्टाल पर धार नगर के २०० जन सामान्य लोगों ने भेट दी और साहित्य विक्रय किया! कार्यक्रम के समाप्ति के बाद विवेकानन्द जयंती व्याख्यान के मुख्या वक्ता श्री लाजपत आहूजाजी ने भी भेट दी ! Vivekananda Kendra Borivali branch conduct Bhartiya Sanskriti Pariksha 2016 examinations for the students of various schools of Borivali and Dahisar on the life of Swami Vivekananda. The main intention of those examinations was that students should study the life of Swami Vivekananda and get inspirations from his life. We contacted around 15 schools and 8 colleges for this purpose out of which 8 schools and 7 colleges shown their interest in this activity. For each school /college 1st, 2nd and 3rd prizes were announced for two categories i.e. 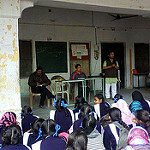 5th to 9th students and Jr. College. It was further decided to give consolation prizes for the students who studied hard and performed very well but could not secure rank in first three.Papers were set based on the life of Swami Vivekananda. Different papers were set for different standards i.e. for standard 5to 7, 8th and 9th, standard 11th onwards different papers were set. Further those papers were set in 3 languages i.e. Marathi, Hindi and English as per requirements of school /college. We received tremendous response to those examinations from schools /colleges. Around 1700 students had shown their willingness to appear in exams. The books based on which those papers were set were circulated to each and every student of the school /college before Divali vacation and it was decided to conduct exams from 21stNov. to 23rd Nov. 2016 after Diwali as per convenience of school /college. Those books were mainly from Vivekananda Kendra and Ramkrishna Math publications. 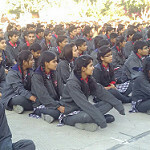 The prize Distribution for students was done in 2 phases. Firstly in school / college level where only certificates where given in front of students and teachers, Secondly prizes announced before the exam where given on vivekananda jayanti on 14th jan, 2017 on Makar sankranti day. Venue is shiv seva ground, Rajendra nagar, Borivali East, Mumbai and Time is 5.30 pm to 7.30 pm. The chief guest for the program is shri. Rambrij Yadav ji (Babuji ) , Social worker and chief speaker is Ma. Vishwasji Lapalkar, Sanghatak maharshtra Prant. Program strated with 3 om, prathana. Then 3 Pratyakshik performed on the stage . Suryanamskar by 14 students from Borivali sanskar varg, patriotic street play by 8 students of LN College Borivali –E , Skit on message of Vivekananda by 7 students from Gorai Borivali –W Sanskar varg. Then samuh Patriotic song by 8 Girl students of Gokhale college, Borivali-W. After that Sri Rajendra Bardeji, Sanyojak of Borivali branch given the introduction of vivekananda Kendra and its activities in brief. Then shri. Paranjpe, vivekananda Kendra karyakarta read the report of the Bhartiya sanskrti pariksha 2016 conducted by Borivali branch.After that Ma. Vishwasji lapalkar addressed the public on the message of vivekanada to the youth and their contribution in the nation building. 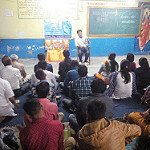 Vishwasjis whole hearted lecture inspired the gathering in which school / college principal were there. Then prizes were distributed to the students by Babuji & Vishwasji. Program is concluded with shanti mantra. On special occasion of Makar sankranti day Tilgul and tea are served to all. Total persons attended the program are 300.The atmosphere during event is energetic. Program arrangement were done by the students who gone to kanyakumari Yuva netrutva vikasan shibir 25-27 Dec 2016 from Borivali branch (2 colleges – LN & Gokhale college and all the karyakartas of VK Borivali. Prof. (Dr.) Yoginder Singh Verma Pro Vice Chancellor said this while addressing a well attended public function in the auditorium of the local Government polytechnic here today organized by Local branch of Vivekananda Kendra Kanayakumari in connection with 154th birthday of Swami Vivekananda. He said that the character of Swami Vivekananda was an inspiration to the youth and his teachings were contemporary. He said that youth could cultivate the qualities of courage and spiritual strength by following his teachings as his thoughts were very scientific in nature.He said that Swami Vivekananda generated spiritual awareness in the society inculcated patriotism among people. Dr. B.K. Chander Shekhar Director of Education in India for Yoga Samaskrutam University Florida said that Swami Vivekananda is major source of inspiration being a matchless personality. He stressed on memory management which was part of the Vivekananda’s personality. Swami Premananda of Govind Jeevan Ashram stressed on the youth to adher to his teachings as these teachings were more relevant now in view of the present national and global scenario. He also stressed for becoming useful citizen and render good service to the humanity through this one can realize God. Ashok Raina of Vivekananda Kendra described the scenes of World Religious conference in his words and said that four Nobel Laureates have wrote about the great saint Swami Vivekananda. He asked youths to come close to the literature of Swami Vivekananda. Babar Singh, an INA freedom fighter who had been in India’s freedom struggle with Neta Ji Subhash Chander Bose was honoured for his contribution in the freedom struggle. Babar singh 93, was accompanied by his wife Sawatri Devi. He was honoured amid claps and was given standing ovation by the audience. Fifty six meritorious students of different schools of Kangra and Mandi districts too were given prizes who had ranked among first ten in each class of different schools in the MCQ test organized by the Kendra in November 20, last year in connection with Sadhna Devas. The program was started with lighting of the lamp by guests amid vedic Chanting following by Swarsati Vandna By Sunil Kumar Director Sangeet Music academy and culminated with Kendra Prathana. KALPATARU DIWAS: On 1st January, 2017 observed Kalpataru Diwas. Adaraneeya Sri T N Prabhakarji, Retd. Secretary to College Education Dept, Karnataka talked importance of the day and Sri Venkataramnji, Well wisher presided the function. Smt Vasumati Didi sung the song related to Sri Ramakrishna Paramahamsa. At the end prasada distributed. 7 Days SPECIAL YOGA SATRA for Alcohol Addict people at Mare Gowdana Halli, T Narasipura Taluk, in which 88 people attended from 27 villages. 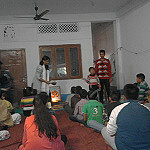 Breating exercise, loosening, Suryanamaskara, Assana & Pranayama and prayer and Bhajan are taught to them. Swadhayaya Examination conducted on 2nd January, at Vivekananda Kendra Vidyalaya, Kallubalu, in which 55 students attended . At Bharati Public school- 100 students, Sri Bharati Public school- 102 students and Vijaya Bharati Public school 6 students wrote the examination on book called “ incidents from the life of Swami Vivekananda”. YOGA SATRA: 10 Days Yoga Satra started with 89 participants at Bannur Sports Club, t Narsipura taluk on 8th January and concluded on 17th January. Prayers, Breathing, Loosening, Suryanamaskar, Asana, Pranayama, and Guided meditation taught. VIVEKANANDA JAYANTI: On 11th celebrated at Royal English school Samskara varga, in which 51 students from 2 samskara varga participated. On 11th January, celebrated at Nanjumalige vistara, in which 140 students from 4 Samskara varga and 16 parents attended. 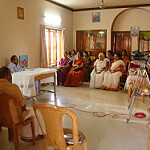 Sri Venkataramnji talked on Swami Vivekananda’s message to students. Sri Shivalingayya, presided the programme. Song by students and experience by Ravi Kumar. On 12th morning celebrated at Bannuru in which 92 people attended. Aravinda Prasad talked on Swamiji, Ma. 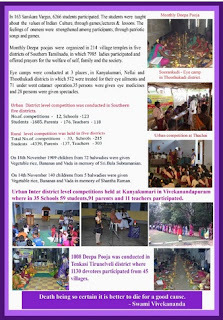 Ekanathji and Vivekananda Kendra and activities. Programme ended with Kendra prayer. Evening celebrated at Kendra Karyalaya, in which 84 people attended. Sri Laxminaryanji, well wisher and donor presided the function, Smt. 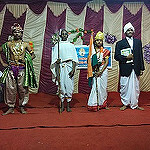 Nagaratnammaji and Sri Gangadharanji was the chief guests. 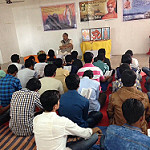 Sri Rameshji, Nagar Pramukh talked about Swamiji and Vivekananda Kendra and activities. 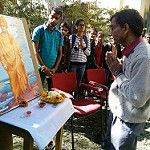 On 12th to 17th Swami Vivekananda Jayanti celebrated at 41 colleges as a YUVA SAPTAHA, in which different activities like quiz on Swamiji’s life, essay competition, patriotic song, painting, elocution etc. Guwahati 12th January 2017: Swami Vivekananda’s Birth Anniversary and National youth Day had been Celebrated in Guwahati Mahanagar by organizing Cycle rally and 28th Road Safety Campaign . 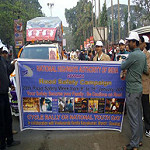 Good number of Youth came out of their homes early in the morning at 6:30 am and went around the heart of the town spreading the message of Swami Vivekananda and road safety awareness in Sobha Yatra .The Cycle rally along with Bike and Vehicles went from Bharat Seva Ashram ,Kalapahar and Dighalipukhri area and culminated at a Field of Deepak Sangha Society ,Nabagraha Road ,Silpukhuri . With a large percentage of the road accidents, fatalities and injuries involving road users in the age group of the youth, the road safety awareness programme was aptly held on the National Youth Day( Swami Vivekananda's Janma Jayanti. A large number of youth were present on the occasion and took active part in all the proceedings. A Cycle Rally was flagged off by Shri Raj Chakrabarty, Chief General Manager & Regional Officer National Highways Authority of India along with members of the Vivekananda Kendra at Dighalipukhuripar and From Kalapahar area near Bharat Seva Ashram ,the Flag off was done by Dr. Saraju Das ,renown Educationist and Social worker . The Cycle rally proceeded through the streets of Guwahati city with display of a Vehicle Decorated with Message of Swamiji and youth Decorated with Bharat Mata. Road Safety banners, placards and distribution of hand bills to the public. The rally congregated at the central location of Silpukhuri where a formal function was held. The function was attended by Shri Ajoy Dutta ,Ex MLA as the Chief Guest and Shri Raj Chakrabarty Chief General Manager (NE), NHAI as the Guest of Honour. The function was hosted by Shri Chinmoy Choudhury, Solicitor- General, Assam.and Sanchalak ,Kamrup Bibhag-,Vivekananda Kendra. Speaking on the Occasion the Chief guest appealed the youth of India to follow the path fold of Swami Vivekananda and Sister Nivedita . Shri Raj Chakrabarty ,Guest of honor highlighted the importance of the youth in nation building and the necessity of the youth to inculcate moral values and good habits to build a strong character. It was also pointed out that youth of today are the prime road users and the importance of the youth to ride safely was paramount. While safety of the self was important, it was also equally important to look after the safety of the other road users. Any accident adversely affects the family involved socially, economically and psychologically. The slogan for road safety –“ Your Safety Secures Your Family. Be Cautious on Road” was therefore very relevant. The function resolved that all the traffic rules must be followed. Use of seat belts by car drivers and compulsory wearing of helmet by two wheeler rider and pillion is a must. Drinking and driving are mutually exclusive and must be avoided at all cost. Safety of pedestrians and other vulnerable road users was of utmost importance. Helping road accident victims within the Golden Hour by good samaritans was also highlighted. Shri Kalyan Dutta ,Sanyojak of the National Youth Day ,while thanking every one requested to follow the Yoga and Pranayam as envisage by Swami Vivekananda .He further stressed that Yoga and Pranayam keep the Human body and Mind in Balance status. So It helps the Driver to Drive the vehicle in a Balanced state of Mind and do not encounter accident .He appealed all road users to practice Yoga and Pranayam at least 1 hour every Day. The function closed with a pledge to adopt road safety as a part of our daily lives so as to ensure the security of our ownselves, our family and fellow road users. Puspanjali at 5 places Badarpur nagar, Jumbasti Kalibari, Org. by Sri Pallab Mazumder, Participation – 15, Speech given by Sri Prasanta Chakraborty & Sri Chinmoy Baruah, GRP Colony, Org. by Sri Barnali Das, Participation – 11, Speech given by Sri Barnali Das, Buddha Colony, Org by Rabinda Nath, Participation – 40, Speech given by Sri Sankar Kar, Srinagar Colony, Org. by Sri Bipasa Dey and Sri Sayantan Chanda Participation – 25, Speech given by Sri Prasanta Chakraborty, & Das Para Akhra, Srigouri, , Participation – 41, Speech given by Sri Shyama Prasad Chakraborty, Sri Bipin Das & Sri Jitendra Ingle. Most respected Morari Bapu Ji, President of the Vivekananda Kendra Shri P Parmeshvaran Ji, My ministerial colleague Pon Radhakrishnan Ji , Swami Ji of the Vivekananda Ashram Chaitanyanand Ji, Balakrishna Ji, Bhanudas Ji, Vice President of the Vivekananda Kendra Nivedita Ji and my dear friends! I would have loved to be in your midst but thanks to the power of technology, we are connected on this occasion. And, in any case, I am no guest but am a part of this family. I am one of your own. 12th January- this is no ordinary day. This is a day etched in history as a day when India was blessed with one of the greatest thinkers, a guiding light and a stalwart who took India’s message to the entire world. I offer my tributes to the revered Swami Vivekananda. He was a giant, whose powerful thoughts continue to shape several minds. No learning stood out as all were learned. None was poor and none was rich. "The deed done by Hanumaan none else in the world could even conceive of attempting-crossing the sea, entering Lanka protected by Raavana and his formidable hosts and accomplishing the task set to him by his king, not only fully but beyond the fondest hopes of all." “Spirituality to me is the way we relate to God and the Divine. Staying connected with our spiritual life keep us grounded and always be reminded of the value of life and important values such as honesty, loving our neighbours, and many other important traits that will make the workplace a positive environment”. Shri.Satish Kumar famous editor of Resurgence and Ecologist writes “Wholeness and harmony are the foundation stones of a new world view”. My existence is a network of influences. I exist in a web of relationships: in reciprocity, mutuality and community. I am because earth, air, fire and water are. I am because my parents, my teachers and my friends are. I am because Buddha, Krishna and Christ are: they are part of my thinking. Shakespeare is, therefore I am. Beethoven is, therefore I am. Van Gogh is, therefore I am. Gandhi is, therefore I am. You are therefore I am. Worms are, therefore I am. Buddhists call it co-dependent arising. Hindus call it Soham: “That is me”, and “I am that”. In South Africa they call it Ubuntu: “I am because we are”. This view of a world of relationships is the underlying theme of ‘Green Rameswaram’ project. In executing this, we seek everybody’s cooperation. This month has the following highlights. 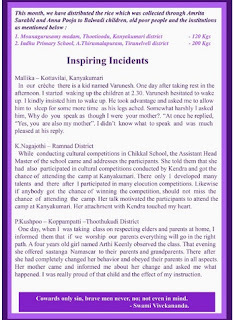 Shri.Karthik of C.P.R Environmental Educational Center writes about Nakshatra Vanam and finally work to build the Social Capital. A workshop for Maths teachers was organised on 8 and 9 January 2017 at VKV Dibrugarh. 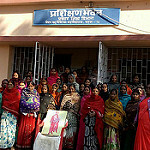 It was organised with the objective of strengthening / enriching our own resource. Besides the resource persons like Sri B. M. Naidu, Vice Principal, VKV Dibrugarh, Kum. 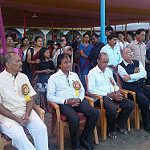 Sudipta Saha, VKV Tinsukia, Sri Dhan Pradhan, VKV (NEEPCO) Umrangso and Smt. Moniparna Gogoi, VKV Golaghat, 12 teachers teaching Maths in class VI and/or VII participated from 8 Vidyalayas namely- VKV Tinsukia(2), VKV Sadiya(1), VKV- NEEPCO- Bokuloni(2), VKV-NEC- Baragolai(1), VKV Tingrai (1), VKV Dibrugarh (2), VKV Dhemaji (1) and V V Jirikindeng (2). 5 Chapters from class VI covered in the workshop besides two sessions on teaching Maths using technology. Basically teachers approach on a particular chapter i.e. how to teach, what to teach and what not to teach etc were main area of focus. Active participation of teachers was seen as resource persons were also our own teachers. On 8th January at 10 am, in the inaugural session of the workshop Ma. Pravin Dabholkar ji Joint General Secy, VK Kanyakumari motivated the teacher emphasizing on teachers creative efforts should be there for eliminating the Maths phobia from the minds of students as well as parents. Vivekananda Kendra Thiruvananthapuram organized Kutumba Milan as the part of Swami Vivekananda Jayanti celebration on 8th Jan 2017 Sunday at Sri Ramakrishna Ashrama,Nettayam. Swami Mokshavratanandaji Maharaj, The president of Sri Ramakrishna Mission and Ashram Shastamangalam and Adharaneeya Radha didi were the chief guests of the day. 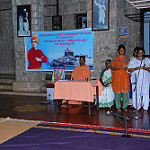 Swami Mokshavratanandaji Maharaj gave margadarshan to the gathering and Adharaneeya Radha didi introduced Vivekananda Kendra to the audience. The program included Yoga (sookshma vyayam) and then games for children and a group discussion on Adarsha Bharatiya Griha for elders. A Yoga Instructor Certificate was issued to Kum.Nidhika.A.R, who successfully completed 6 months YCC at Vivekananda Kendra Kanyakumari. About 80 people participated in the 3 hours program. Vivekananda Kendra Kanyakumari cordially invites your goodself for the formal Inauguration of Ramayana Dharshanm, Bharatmata Sadanam and 27th feet height Veer Hanuman statue in the Vivekanandapuram campus of Kendra, on 12th January 2017 at 5:00 p.m. by Sri Narendra Modi, the Hon'ble 'Prime Minister of India, through video conferencing. Poojya Sri Morari Bapuji, well known Ramayana Katha Guruji will grace the function and light the lamp in Ram Darbar and offer flowers. Sri Pon Radhakrishanan, Union Minister of State for Road Transport and Highways, will be the Chief Guest and switch on the Eletric lamp at the statue of Veer Hanumanji and offer flowers. Mananeeya P. Parameswaranji preside over the function and light the lamp at Bharat Mata Sadanam and offer flowers. Revered Swami Chaitanyanandaji, Vivekananda Ashramam, Vellimalai will unveil the portrait of Swargeeya Eknathi Ranade, the Founder and Soul behind the Vivekananda Rock Memorial and Vivekananda Kendra, in the “Arise Awake” Exhibition. Kendra heartily invites you for this auspicious programme. The event will be live on DD and ANI, It will be live on PM’s YouTube and Facebook also. 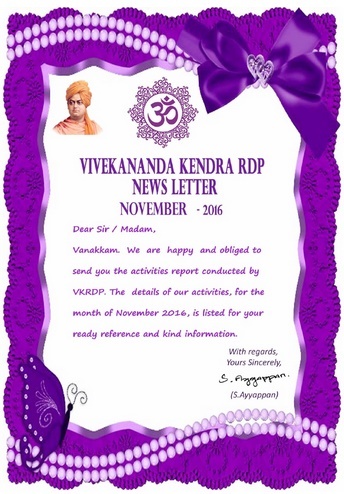 Vivekananda Kendra Shiksha Prasar Vibhag organised 3 days “3rd Social Science Exploratory Project” at Vivekananda Kendra Vidyalaya,Tingrai from 28th December to 30th December 2016. In this entire Project 19 VKVs from all over Assam & Nagaland including 2021 students participated and surveyed 2648 families. The total number 26 Villages and 09 Sattras were shown through power point presentation by our students. Mahaprabhu Sri Sri Nanigopaldev Goswami, Sr Sri Sattradhikar of Dakhinpath Sattra, Majuli was adorned as the Chief Guest,the expert & the academician Sri Sristidhar Dutta, Faculty of Social Sciences, Rajiv Gandhi University graced this occasion as the Guest of Honour, Sri Pranjit Kumar Deka, General Manager of Oil India Limited, Duliajan was the special Guest, Sri Pravin Dhabolkar, Joint GeneralSecretary of Vivekananda Kendra, Kanyakumari was also present in the inaugural ceremony of 3rd Social Science Exploratory Project whic was conducted at 4.00 p.m. on 28th of December. The two days power point presentation was followed by Panel discussionon villages under the guidance of Dr. Balin Hazarika, Retd. Professor of Political science, J.B.College, Jorhat. The second day started with prath smaran and yogaabhyas. It was followed by PPT presentation of Villages. The 26 villages were presented by the evening. There Bhanjan Sandhya which vibrated a devotional and positive energy among all the participants. The third day was the presentation of 09 Sattras. In addition to that a few cultural programme was also presented by the students Vivekananda Kendra Vidyalaya,Tingrai, that was appreciated by all the present there. The Valedictory Programme was conducted at 4.00 p.m. on 30th of December in which Dr. Balin Hazarika, Retd. Professor of Political science, J.B.College, Jorhat, Dr. Sovarani Sarma, Prant Pramukh, Assam Prant, Vivekananda Kendra , Sri Dilip Kumar Das, PRO( Head) Oil India Ltd. Duliajan, Sri R.N.Pathak were graced this occasion. Sri Kishor Chandra Moharana, Principal of the host School Vivekananda Kendra Vidyalaya,Tingrai and co-ordinator of 3rd Social Science Exploratory Project presented the Project Report in details, Then the students were given away the Proficiency and Appreciation Prizes. 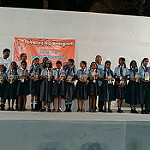 VKV, Golaghat, VKV, Ramnagar, Silchar, VKV, Bokuloni were given Best Performer Award. At last Su. Reboti Devi, Joint Secretary of VKSPV, Guwahati cast the vote of thanks. It was concluded with shanti mantra. 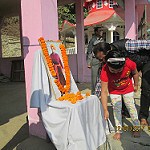 Geeta Jayanti was celebrated in two places in Karnawati. In Ghatlodia Programme was started with teen Omkar prathna then krishna’s bhajans had been sung by Deepbhai and Dhrumaben . Karmyog Adhyay 12 sholkas had been sung by karyakartas under the leadership of Aa. Lokeshbhai. Aa. jaydevbhai was the speaker of that day. He was spread the actual message of Gita. He had addressed that Gita teaches us spirituality. Our whole Kutumb Vyavstha could be going well, if we follow and implement it in our life. The programme has been over with dinner. 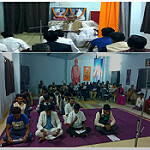 In Gandhinagar, Karmayoga sholka chant by karyakarata. The program was followed by bhajan and end with dinner. We lost a great Gandhian, environmentalist and a water warrior Shri.Anupam Mishra on 19th Dec. 2016. All his life he strived for water democracy. His two books (i) Aajbhi Khare Hain Talab (the ponds are still relevant – published in 19 languages and sold one lakh copies) and (ii) Rajasthan Ki Rajat Boondein (The Radiant Raindrops of Rajasthan) are guides for all the stakeholders including Govt. Shri.Anupamji’s Hindi was so sweet and poetic that after listening one will fall in love with the language. Attending his talks or slide presentation was a treat to everyone. Making people water literate will be a real tribute to him. In this month, Shri.N.Krishnamurthi covers the topic of “Agriculture – Land, Fertiliser, Pesticide, Livestock and Forests”. In happenings, we have covered training programmes in NPK rich Bio-manure preparation, Azolla cultivation, Ferrocement technology, etc. In addition, this month we have covered the Annual day celebrations of Amudha Surabhi SHG federation to whom VK-Nardep supports. In the wisdom section, the famous ecologist, Edward Goldsmith tells us how the so called development destroys the social structure while Aurbindite Dr.Madhusudana Reddy exhorts us to discover our own infinite dimension and finally Acharya Rajaneesh relates Religion to the wonderful music of life. ITANAGAR, Dec 27: Pomliang Village became the winner while Tafrogam Village stood second in the Circle Level Traditional Dance Competition on Sunday with a cash prize of Rs 6000/- and Rs 4000/- respectively. Organized by Vivekananda Kendra, Tezu, Arunachal Pranta as part of Samarth Bharat Parva at Tamla-Du hall Tezu, Tafrogam village also bagged first position in Traditional Drama Competition. The best team/performer in Circle Level in both Drama and Dance will take part in the District Level competition on January 12, 2017. Vk assam Prant Kps started on 24th Dec. 2016 (25-30 ), Participants 106, Organizing team 30, Sri Sanjay Deka Dr Kabul Saikia Dr Sova rani Sarma Sri kamalakant were the resource person. Consolidation of our work is the main theme. Imparted skill of Karyapaddhati, Baithak and patrons. Karyakartas are getting ready for consolidation of work in Assam. On the holy Occasion Holy Mother Sharada Devi Jayanti, MatruPooja organised at Kendra Karyalaya on 22nd December. 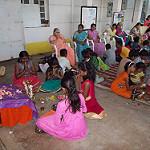 Children of Anandalaya performed pooja to their mothers. BhaginiSoumya talked about the importance of mothers in every ones life and she talked about Holy mother and shatanamavali of mother. At the end SmtNagaratnammaji conducted guided meditation. 24th to 29 Dec Sanskar Varga Gat Pramukh Prashikshan shibir organized at Tezpur. 65 participants and 25 Karyakartas are present. Assam Prant has plan of 100 Sanskar Varga in year ahead. Ka kha and ga of Sanskar Varga and Suryanamaskar skills are imparted. Concept and need of Sanskar Varga were the part of the camp. Daily 1 and half hours model Sanskar Varga is also part of the Prashikshan. 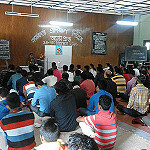 To develop Swami Vivekananda’s philosophy of Education, strengthen the learning of life-skill and the inner qualities of students, Vivekananda Kendra Shiksha Prasar Vibhag (VKSPV) organizes different programmes for the students and teachers of Vivekananda Kendra Vidyalayas (VKVs) of Assam and Nagaland. This year 5th Srimanta Sankardev Natya Samaroh (SSNS), An One Act Play competition, was organized by VKSPV, Guwahati from 11 to 13 November 2016 at the venue Vivekananda Kendra Vidyalaya Nalbari. Paticipating School: VKV Tingrai, Golaghat, Bokuloni, Dhemaji, Suklai, Ramnagar, Majuli, Umrangso, Sadia, Dibrugarh, Kajalgaon, Badarpur, Baragolai, Tezpur, Sivsagar and Borojalenga, Nalbari, Tinsukia and Doyang. 5th SSNS’s Udghatan Samaroh (Inauguration Programme) held on 10 November in the Campus of VKV Nalbari with 800 audiences. Chief Guest for the programme was Hon. Sri Dipok kr Barthakur, Vice Chairman, State Planning Board, Govt. of Assam, Guest of Honour was Sri Anant Gyani(IAS, Deputy commissioner). Special Guest was Sri Upakul Bordoloi, Actor and Director (Assamese Film). Mananeeya Sri Pravin Dabholkar, Secretary VKSPV blessed the occasion and given a proper direction for the success of the Samaroh. Flag hoisting, Balloon release, Band display of the participants, Cultural staging by the students followed by the speeches of the distinguished guests. Everyday 8 teams used to perform. The drama competition started at the venue Natya Mandir Nalbari exactly at 9:30 a.m. every day with the performances of eight(8) teams. The judges for the programs were: Sri Dwijen Nath, Sri Niranjan Bhuyan, , Sri Rajib Kro, and Smt Reeta Devi, all are popular playwright and actor/director of Assam. Evening 3 pm onward the SAMAPAN SAMAROH was started in the VKV Nalbari Campus. Hon. Sri Ranjeet Kumar Dass, Speaker, Legislative Assembly Assam. The prizes were distributed by Sri Sanjib Das, Mananeeya Meera Didi, Prant Sangathak , VK Assam Prant and Sri R.N. PathakJi, Office In-charge VKSPV Guwahati. After the programme the Flag of the Natya Samaroh was brought down and handed it over to VKV kajalgaon by Maneeya HanumantharaoJi, for conducting the 6th Srimanta Sankardev Natya Samaroh next! • DVDs containing performance of all the Dramas were done and distributed to the teams on the concluding day. • A compilation of all the scripts by schools in a Book format is planned so as to get reference and collection of dramas in future. • A Video Clip of every prize winners were arranged immediately on the concluding day and displayed at the time of prize distribution.